Today's Arizona Daily Star has a short piece about Jimmy Stewart's "Weather Bus" initiative, launching in October. We at the Physics Factory feel as if we might be responsible for this, since we started doing outreach to schools with our Physics Bus back in 2003! Now we also have the "Arizona Mathematics Roadshow" (the Math Bus for short). Jimmy "will visit schools in a bus that has been converted to a schoolroom, teaching the science of weather to children." You can check it out at www.weatherbus.org. The Physics Factory entertained kids and adults alike with various demonstrations. 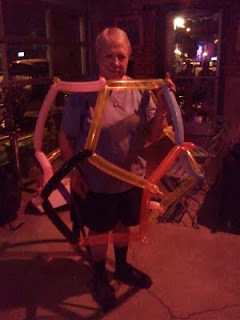 Bruce made a nifty dodecahedron out of 20 balloons and put Dolly inside! The geometric balloon wands and swords he made even elicited tips from appreciative youngsters. We'll be there once a month from 5-7pm, so mark your calendar.